PreLaw magazine has ranked Hofstra Law 3rd among all U.S. law schools for average annual increase in the employment rate for graduates from the Classes of 2011 through 2015. The rankings were announced in preLaw’s Back to School 2016 issue. 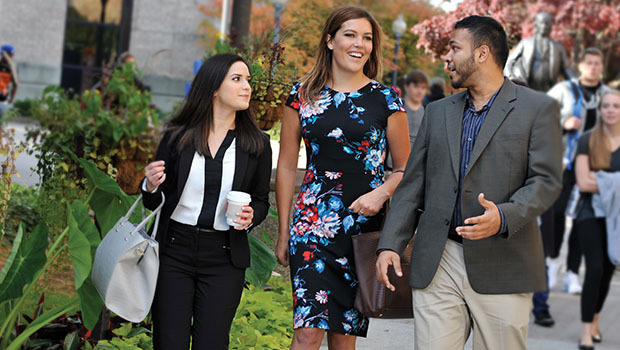 With an average annual increase of 5.41 percent, Hofstra Law is one of only five law schools that have improved their employment rates by an average of 5 percent per year or more since 2011. This recognition for the employment success of the Law School’s graduates comes on the heels of the spring 2016 rankings by Law School Transparency (LST), in which Hofstra Law ranked 52nd among all U.S. law schools for its Class of 2015 employment outcomes. In its analysis, preLaw used a modified employment score that considered the quality of the position. For example, the magazine explains, a full-time, long-term bar-passage-required job (the type of employment law school graduates value most) was given a 100 percent weight, and a part-time, short-term job that did not require the bar exam was weighted at 10 percent. The article also highlights programs at Hofstra Law that have contributed to the improved employment rate, including assistance from the Alumni Association’s Career Services Committee and several initiatives organized by the Office of Career Services. For instance, the office introduced mandatory resume reviews, which emphasize cover letters, for second-years during recruiting season. “We focus on how to draft professional letters, since everything matters,” Associate Dean for Career Services Christopher Caruso told preLaw. Also noted in the article is a series of required professional development seminars, offered for the first time this fall, scheduled around when first-years are applying for and interviewing for internships. PreLaw also mentions the practical training and experiential learning Hofstra Law offers through legal clinics, externships and a new capstone course introduced in 2015-16 to prepare students for jobs in the growing field of legal technology. “Many firms are hiring technology officers with a law degree, and we try to be aware of trends and respond to the needs,” Professor Jennifer Gundlach, who developed and teaches the course, told the magazine. Read the full article “Most Improved Schools for Employment” in preLaw’s online Back to School 2016 issue.